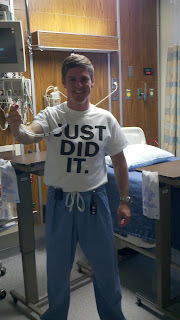 Medical Evidence Blog: Bite the Bullet and Pull It: The NIKE approach to extubation. Bite the Bullet and Pull It: The NIKE approach to extubation. I was very pleased to see McConville and Kress' Review article in the NEJM this week (December 6, 2012 issue) regarding weaning patients from the ventilator. I have long been a fan of the University of Chicago crew as well as their textbook and their pioneering study of sedation interruption a decade ago. In their article, they provide a useful review of the evidence relating to the discontinuation of mechanical ventilation (aka weaning , liberation, and various other buzz words used to describe this process.) Yet at the end of the article, in describing their approach to discontinuation of mechanical ventilation, they provide a look into the crystal ball that I think and hope shows what the future may hold in this area. In a nutshell, they push the envelope and try to extubate patients as quickly as they can, ignoring inconvenient conventional parameters that may impede this approach in select instances. Much of the research in this field has been dedicated to trying to predict the result of extubating a patient. (In the case of the most widely cited study, by Yang and Tobin, the research involves predicting the result of a predictor of the ultimate result of interest. This reminds me of Cervantes' Quijote - a story within a story within a story....but I digress.) And this is a curious state of affairs. What other endeavor do we undertake in critical care medicine where we wring our hands and so helplessly and wantonly try to predict what is going to happen? Don't we usually just do something and see what happens, making corrections along the way, in silent acknowledgment that predicting the future is often a fool's errand? What makes extubation so different? Why the preoccupation with prediction when it comes to extubation? Why not "Just Do It" and see what happens? The answers to these questions, I think, rely as much on the culture and psyche of critical care medicine as they do on the evidence. Here, I will speculate and hypothesize the many ways in which I think the culture and psyche of critical care (and the evidence they engender) conspire to create an atmosphere of trepidation that leads to prolonged courses of mechanical ventilation for many, many patients. 1.) The need for reintubation: This doesn't seem to be such a bad outcome in its own right. After all, a patient was intubated, then was extubated, and needs to be intubated again. So we're right back to where we started. What's so bad about that? Well, if being reintubated is bad for the patient, then it goes by implication that something during extubation, the period afterwards, or during reintubation has negative consequences for the patient. I cannot think of anything intrinsically bad about the act of extubation. But afterwards, I suppose if a patient is struggling to breathe and clear secretions which are accumulating and they're getting tired out, weaker, anxious, etc., that this could be a setback even if they are reintubated, and the setback may be worse the longer it takes to reintubate them. How much of a setback is anyone's guess, unless s/he is overly smitten by that Epstein et al article in Chest in 1997. That observational study did indeed show worse outcomes in patients who were reintubated, BUT - it was a retrospective observational study in a single center involving only 289 patients. Obviously,reintubation in those patients could simply be a marker for severity of illness, having a crumby doctor, unmeasured covariates, etc. I just think that it would be silly to predicate all our fear of extubation failure on an observational study published in Chest 15 years ago. In any case, it would seem logical that any setback incurred by a failed extubation may be proportional to the amount of time that elapses before the patient is reintubated and to any problems encountered during reintubation. Thus, it should be critical to recognize the failed extubation early and to quickly reintubate the patient. But several contingencies may impede quick recognition and prompt reintubation. First would be the availability of a reliable assessor of the success or failure of extubation, i.e., an experienced physician, probably an attending physician directly and repeatedly observing the patient in the hours after extubation. Without intending any offense to any parties, I doubt that this could be achieved at a teaching hospital where the bulk of the patient assessments are performed by housestaff, nor could it be achieved in a busy private setting where a single physician is multi-tasking between the clinic, the bronch suite and the ICU. Second, and this harkens to a point I will make later about the ego, the assessor would have to be immune to any tendency toward denial that the extubation trial was a failure and to delays in acceptance that might stem from his or her ego and its desire to be correct about the extubation prediction. Third, an operator who is highly skilled in airway management would have to be immediately available to reintubate the patient once the assessment of failure has been made. Again, this may not be the case in certain settings such as training facilities, and patients may be better off left intubated than risk being reintubated with multiple attempts by a trainee. One might expect there to be an interaction between delay in recognition of the need for reintubation and the complications of reintubation, as the latter may increase in proportion with the duration of the former. 2.) Psychological impact of failed extubations on the physician: There are several reasons that a failed extubation may negatively impact the physician's psyche. First, in part as a result of the culture that has evolved around prediction of the success of extubation, a failure of extubation may bruise the ego of the physician, whereas an unnecessarily prolonged period of intubation will go "unscored" and will not affect the ego. Said in another way, waiting until extubation success is a near certainty protects the ego of the physician, even though it compromises the well-being of the patient because it can never be known when was the earliest opportunity for successful extubation. Second, failed extubations are stressful and increase workload, as does repeated reassessment of the patient after extubation. Failed extubations are stressful especially if the operator is not very skilled in airway management. And here's the elephant in the room: many pulmonologists are not skilled intubators, and indeed some pulmonary fellowships do not even teach airway management. (I am a graduate of one of those institutions, but fortunately I have supplementary training.) And onto the stage comes the ego again - suppose that you are not a superb manager of the airway, and you may experience either great difficulty reintubating the patient or you may have to ask for help from a colleague from the ED or anesthesia department. Well, this certainly serves as a deterrent for you in pushing the envelope in the extubation department. 3.) Practical and pecunairy implications of pushing the extubation envelope: Here's another elephant in the room, one that I have recently witnessed trouncing around a private ICU. Imagine practice A where there are four physicians running an ICU and pushing the envelope, extubating patients at the earliest opportunity. Suppose their extubation failure rate is double the average at 30%, but their length of stay in the ICU is nonetheless reduced by 30% as a result of their expeditious extubation practices. Two practical and pecuniary things happen to Practice A as a result. One, the number of patients they must reintubate, often at highly inconvenient times, doubles, as does their need to hold vigil over patients after extubation, thus significantly impacting their workload. Two, their census declines by 30%, and this significanlty impacts billing and collections. Indeed, it reduces ICU billing revenues by 30%. Three, insomuch as patients' families consider the success of extubation to reflect on the prowess and competence of the physician, practice A has compromised patient/family (and probably RN and RT) relations. Now, imagine practice B. They do not extubate early. Thusly, their ICU length of stay and ICU census is 30% higher, and so is their billing. They need not deal with the stress of frequent reassessments after extubation, because reintubation is rarely required. Patients' families (and RNs and RTs) are contented by the predictable result of extubations and the relative calm of the ICU. So tell me, dear reader - will honor and magnaminity override stress and financial loss and impel physicians to do the right thing? Or will they fall back on the science of prediction as protection from lost revenues and increased workload in the ICU? 4.) Impact of failed extubations on calibration of extubation decisions: As followers of this blog know, expert judgment and decision making, especially prediction and prognostication, depend on three things in addition to baseline intelligence: domain specific knowledge, iterative practice, and prompt feedback. Extubation decisions appear to be ideally suited to the paradigm of prompt feedback. Now, suppose that practice A and practice B are represented by physicians of equivalent intelligence, knowledge, and experience. But A and B differ in their aggressiveness in terms of extubation. Practice A extubates aggressively and has a failure rate of 30-40%, and Practice B is very conservative and has a [laudable?] failure rate of 10%. Each practice has the opportunity for meaningful feedback only in those cases in which extubation fails. And several are the implications of this difference between practice A and B. First, Practice B essentially gets no feedback, because the failure rate of 10% is not far from the random variation around their extubation failure rate. Second, Practice B is expected to become more conservative about extubations because every failure is an anomaly from what is expected and will reinforce conservative practices. Third, Practice B, as a result of low feedback, is uncalibrated and will have unexpected failures as a result of lack of calibration. This will also reinforce conservativism. Fourth, Practice A will become increasingly calibrated from enhanced feedback. Because of their elevated tolerance for failure this will lead to the opposite result as Practice B - they will become less conservative with time. As they become increasingly calibrated, their success rate will creep upwards. Combined with an increased tolerance for failure, they will push the envelope further, extubating more and more patients through increased sensitivity (with narrower confidence intervals) while tolerating the attendant reduced specificity, which, ironically, provides feedback. I bet we could do a computer simulation of this phenomenon. Please e-mail me if interested. Suffice it to say that if the failure rate is too low, many compromises in addition to prolonged intubation times are accepted in this Faustian bargain. The subtext of this entire discussion entails several other premises about intubation, extubation, and mechanical ventilation which are not necessarily correct. The first is that we know who needs to be intubated and reintubated - that is, that we have reliable and accurate ways of predicting the "need" for intubation, and that the "assessors" whom I refer to above are reliable. I am not aware of any credible studies validating criteria for the need for intubation. Indeed, many/all of the studies of adult respiratory failure and mechanical ventilation, such as the ARDSnet studies, require intubation and mechanical ventilation for enrollment, but this entails an implicit assumption - that these patients were appropriately intubated and that continued observation, supplemental oxygen, and non-invasive ventilation either failed, were likely to, or their continued use would put the patient at risk of subsequent catastrophic deterioration. Criteria for reintubation in such studies are likewise left to the discretion of the clinicians. This is perhaps an area for future research. The second, a corollary of the first, is that patients who are intubated are most often assumed to have been appropriately intubated, and the percentage, whatever it may be, of patients who were inappropriately intubated is ignored. This has obvious implications for expeditious extubation, for any such percentage of inappropriately intubated patients ought to be extubated right away. These patients were most often intubated under circumstances that are poorly documented and for reasons that are poorly or incompletely articulated, such as patients intubated in the ED, on the medical floor by trainees or non-pulmonologists, those intubated in the field by paramedics, among others. Often, I have found that the reasons for intubation do not pass muster by my own criteria, such as obese patients and many others who are intubated not for distress but rather for abnormalities in arterial blood gas results. (Those interested in a diatribe about the phenomenon of inappropriate intubation are referred to my other blog Status Iatrogenicus.) And here the psychological nuances of medical practice again reassert themselves: extubating a patient newly arrived from the floor or the ED entails a good deal of cognitive dissonance, perhaps because of status quo bias or sunk cost bias, or the impact on the ego of the original intubator or the extubator. Extubating a patient soon after the initial intubation is going to harm one ego (the original intubator if extubation is successful) or the other (the extubator if extubation fails.) So it would appear to be a lose lose situation - better to wait till the morning when everybody's a winner. There is one more issue that was ignored in the review but which I think has paramount importance. Some patients are just not going to ever succeed at spontaneous breathing, and probably should not be ventilated in the first place but nonetheless are. The 86 year old male with poor functional status, a stroke with hemiplegia, Parkinson's dementia, and a hip fracture who is weak or has already failed extubation has disease processes which are expected to eventuate in the inability to sustain spontaneous ventilation in the immediate or near future. Unless a realistic assessment of this situation is made, we can never calibrate a decision about his extubation, because he is expected to fail. These kinds of realities must be incorporated into our decision frameworks lest they be hopelessly skewed by inappropriately low estimates of failure in such cases. What is my proposal? How do I practice? Firstly, I take mental status and ability to follow commands very seriously. If a patient has a disease that compromises this, especially one whose natural history leads me to believe that it will be prolonged, I do not extubate. After all, one final common pathway to death is accumulation of secretions, hypoxemia, and death. But if a person is awake and follows commands and is not weak, and they have even reasonable oxygenation and ventilatory parameters, I have a very low threshold for extubation. I do not worry very much about pressors; fevers; heart rates; drain outputs. I ignore f/Vt altogether. I ignore respiratory rates of 40-50 in communicative patients who are anxious and tell me they're gagging on the tube such as the 23 year old with ARDS I extubated on day 1 with a respiratory rate of 50 last week, as well as in many others. I ignore PEEP levels in the obese, many of whom never needed intubated in the first place. I ignore failure to follow commands in patients who are fighting the restraints so vigorously that I worry they will break - such patients are often just peeved and will behave when the tube is removed and breathe just fine. I ignore a lot of things that others use to predict failure, and my history of ignoring them has allowed me to see firsthand what happens and to calibrate my decisions accordingly. I err on the side of thinking patients can breathe on their own as long as inspired oxygen levels are less than60% , there is no significant airway obstruction, no marked weakness, and clear mental status. Then I extubate, watch carefully for several hours, and reintubate promptly as soon as and whenever it becomes clear that they are failing. And, importantly, I don't take it personal. As regards future research, I propose a study where very lax standards, such as described above (follows commands; no weakness; FiO2 less than 60%; no airway obstruction) are utilized to clear patients for a "trial of extubation" with prompt reintubation if they fail. And I'm willing to wager that mortality is the same or better and time on vent and length of stay are markedly reduced in the intervention group. Only time will tell if the critical care community can overcome its penchant for prediction and its psychological reservations and Just Do It - pull the tube and give patients a chance to breathe. Scott - thanks (again) for enabling my procrastination problem with another excellent post that I tell myself I should read after work, but can't. Following along with your "thought process" is educational in and of itself. I am a chest physician working in a regional hospital hospital in middle-Taiwan. I absolutely agree your opinion that we should push the envelope and have a NIKE approach on ventilator patients. It's probably the reason why McConville's article can be published in NEJM. I like your article, too, because you tell the truth. I learned a lot. A reader (CTB), an RN from Johns Hopkins School of Nursing, recently noted that the above notions are also reinforced by the critical care saw that says that patients who self-extubate don't need to be reintubated. And this great point demonstrates (if the saw is true) that at any time in the ICU there are patients who are ready for extubation and we're failing to recognize it. We could also use such patients as a case study to investigate what characteristics make them successful extubations (strong, awake) and what characteristics are delaying their extubation by clinicians.